Boone Central golfers saw plenty of action without leaving town this past week, competing against Fullerton and Twin River in a Tuesday triangular at the Albion Country Club and hosting the annual Boone Central Invitational Saturday. 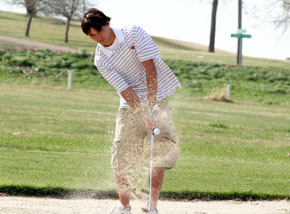 Competitors faced near gale-force winds in the triangular meet Tuesday, rendering scoring conditions very difficult. Fullerton won the varsity competition with a 190 team total, followed by Twin River (193) and the host Cardinals (205). Twin River had the low score in JV play, 207, with Boone Central (225) second and Fullerton (243) third. With numerous out-of-bounds stroke penalties plaguing many golfers, Tanner Warner was the only Boone Central golfer to break 50, firing a 46 over the nine-hole A.C.C. layout. Logan Frey finished at 52 and Curtis Thompson 53, while Kevin Liss and Alex Schafer each shot 54. Jesse Zwiener led Card JV golfers with a 50. Other JV scores were Hunter Henry 55, Miles Wynn 58, Mark Tisthammer 62 and Jacob Olson 65. Saturday, in much better conditions, the Cards had one medalist and finished 8th in the team standings of their Boone Central Invitational tournament. Senior Alex Schafer bounced back from a tough Tuesday round to fire consecutive 42s at the Albion Country Club and placed 13th with an 84. Boone Central finished with a team total of 372. The Norfolk High JV edged Norfolk Catholic 335-337 to win the team title, with Wayne (339) just four strokes off the pace. Catholic’s Ben Rowse was the individual medalist with a one-over par 73. Along with Schafer, Tanner Warner shot a pair of 47s to finish at 94 and Logan Frey also recorded a 94 with rounds of 48-46. Kevin Liss rounded out the counting varsity scores with a 52-48/100 and Curtis Thompson finished at 54-52/106. The Boone Central JV finished 12th in the 13-team field with a score of 428. Card JV scoring was Mark Tisthammer (49-53/102), Hunter Henry (53-51/104), Sean Soll (56-53/109), Jacob Olson (54-59/113) and John Kennedy (64-65/129).